Can you believe it? The summer is almost over and it’s time to start thinking about back to school preparations. If you have a preschool age child, the first big step into formal learning and education is just around the corner. And since the first day of preschool is such a milestone, it can bring some nerves with it for both parent and child. (Admit it. You’re probably more nervous than your little learner.) But don’t worry too much. Below we have compiled a few well tested tips and tricks to make the first day of preschool go smoothly without too many tears (that means you too.) Let’s take a look. 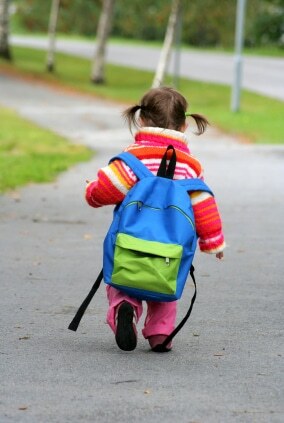 If you’re worried that your child may suffer some separation anxiety or may get overwhelmed on the first day of preschool, resulting in a lot of tears and turmoil, it’s important that you introduce them to both the concept of school and what they can expect on the first day. This can be done in a number of fun and exciting ways too! Talk with your little scholar about your experiences in preschool (if you can remember them. If you can’t there are some great first day of preschool books that can help). Arrange a playdate with some of the other children in the class. This will make the preschool class more familiar and less alien on the first day of school. Take them shopping for supplies for the first day of preschool. Let them pick out a new backpack and maybe even a lunchbox. When the first day of preschool arrives, they will be too excited to use their new gear to be nervous – hopefully. On the morning of the big day, try to plan things so that there isn’t a sense of hurry. Don’t rush through the morning. Hurrying through the morning can exacerbate any anxiety that you little one is keeping under the surface. Showing up early to the first day of preschool will help your child (and you!) ease into the classroom setting. First Day of Preschool Tip 4: Leave them with a security object. This object can be any preschool approved toy, stuffed animal or personal item. A great way to relieve your child’s anxiety about starting preschool is to give them an object of yours that they can take care of. Tell them that they are in charge of the item until you get back. This will reassure them that you will, in fact, be returning, which will reduce any separation anxiety. Dragging out the goodbyes can create a sense that you are worried and increase your little one’s anxiety. Try – as hard as you can – to keep from crying. It’s a big milestone for them, you are beaming with pride, expectation and worry – will they be okay? Of course they will. Once you have said your goodbyes and promised to return, get on with the rest of your day. Your little scholar won’t be able to start his day until you do. Watch Me Grow North Las Vegas is dedicated to creating a nurturing, fun and safe preschool for all our children. Come check out our North Las Vegas Preschool programs and join us for the first day of preschool! We look forward to hearing from you!